Whereas some young students get together and relax with video games, the intrepid members of the Middle School Mathcounts math club chilled with some complex equations in order to prepare for the Mathcounts event held on February 2 at the University of Hartford. Their hard work paid off as the team of four - Guru Anand ’25 of Windsor, Rayyan Haider ’24 of West Hartford, Arav Kumar ’23 of Manchester, Toby Van Wilgen ’24 of Simsbury - performed well at the event with Kumar and Van Wilgen ranking in the top one percent in the nation. 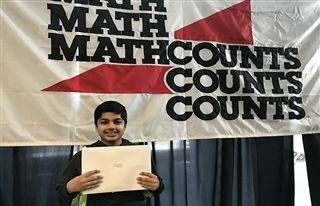 Kumar was ranked 27 out of the 200 students so he will move forward in the state championship on March 9. This was the first time the KO team competed, however, Kumar participated in the event last year. “Last year I was ridiculously nervous and that made me mess up. This year I was more confident. My teammates supported me and that made a big difference,” he said. The weekly two to three hours practice consists of reviewing the school, regional and state tests from last year, solving 100 problems in a book that the organization provides, watching short videos on how to tackle complex problems and following along with a “trainer” that generates questions. Every other week the team travels to Kumar’s house for a retreat where his mother coaches and provides snacks. Kumar serves as captain of the team, and he feels by assisting his teammates he is also sharpening his own math skills. The Mathcounts event is structured with the sprint run of 30 problems in 40 minutes in which you are not permitted use a calculator, a team round of 10 questions in 20 minutes with a calculator and an individual target round - four pairs of problems that must be solved in 24 minutes. “I think in a super logical way. It’s what’s the most obvious to me, but it's also so out of the box. I don't think with restrictions," he said. Kumar enjoys English and credits KO for making him a better writer. He explained that the upside of math is his ability to solve a problem in a short amount of time, whereas an essay may take a few weeks to write. But, there’s more to Kumar just earning a spot in the winner’s circle. For all his effort, his mother promised him a puppy if he made states. Mom, that’s quite an incentive!